To register as a new customer enter in the following information for your account. Your customer id will be used to sign in along with your password. 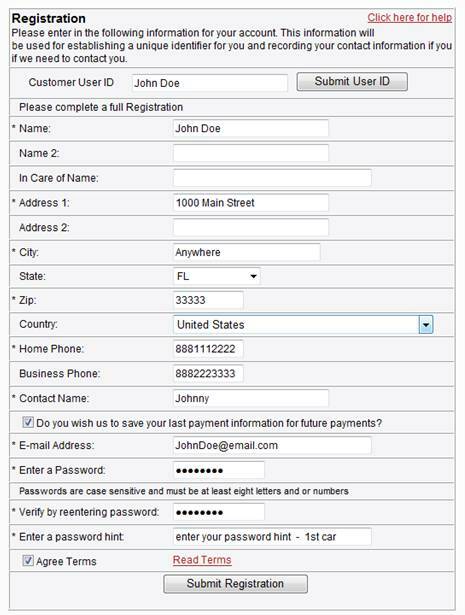 Once you enter a Customer User ID hit the Submit User ID button. If the user name already exists the screen will show User Already Exists at the bottom of the screen. Hit the back button to use a different user id. To register as a new user fill in all the required information on the screen. The fields with *’s are required fields. The Password you enter is case sensitive and must be at least eight letters and or numbers. After all required fields are entered check the box Agree Terms to agree to the terms and hit the Submit Registration button. Remember! Keep your customer id and user password in a safe place.